Aircraft leasing is worth more than €500m to the Irish economy and it supports almost 5,000 jobs, according to a report by accountants PWC out earlier this year. 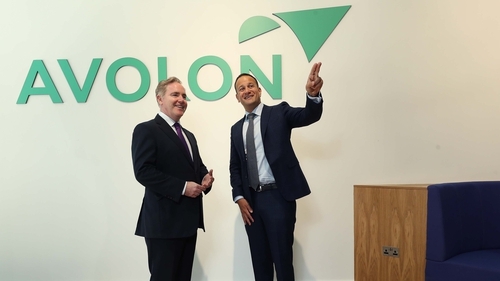 Avolon is one of the third biggest aircraft leasing companies in the world and Taoiseach Leo Varadkar is officially opening Avolon's new offices in Dublin today. Avolon founder and CEO Dómhnal Slattery said it is a clear sign of the company's long-term commitment to the country. "After the Chinese acquired us a couple of years ago, there was a debate internally as to whether we'd move to Hong Kong. I actually lived in Hong Kong for over a year, but we've decided unequivocally that Ireland is our long term home." Ireland is a hub for aircraft leasing companies, and Mr Slattery credits the establishment of GPA by Tony Ryan in 1975 for making Dublin a hub for the industry. "It was the genesis of the aircraft leasing industry," he said. "Today almost five in every ten aircraft flying around the world are leased, and over 50% of those are owned and managed by Irish companies." The Avolon CEO said Ireland is not just a hub because of a favourable tax regime. He said it was forward thinking in the 1960s and 1970s when governments took a proactive approach to withhold tax treaty networks all over the world. "So it's not so much that it is favourable, it's just that we have put favourable treatments in place with more countries around the world than almost any other country," he said. Leasing aircraft offers financial flexibility, and residual value management. "It's the way all of these asset management heavy industries all over the world are going," Mr Slattery said "So for example in the hotel industry, most hotel owners are operators. Airlines have become sales and marketing companies if you like, and the lessors who are better suited from a balance sheet perspective, own the assets and take the risk." Avolon's total fleet including those flying around the world is almost 900, and the value of that is getting close to $50 billion. Mr Slattery said the company is probably a top three customer of Boeing and Airbus. Avolon is diversified globally, with 160 clients spread throughout the world. "We have a bias towards Asia and emerging Asia," he explained. "About 50% of our exposure is India East. The reason for that is pretty clear. A billion people will move from working class to middle class in that part of the world over the next ten years and they're moving off trains and buses onto their first flight on aircraft." Other countries are vying for some of the aircraft leasing business seen in Ireland. Mr Slattery said two jurisdictions in Asia are making a real push towards securing more lessors based in their areas - Singapore specifically and Hong Kong recently changed its tax laws. Avolon has offices in both Singapore and Hong Kong. "So what you find is that the big global lessors like ourselves or nine of the top 10 are based within one square mile of here. We all have offices all over the world. The challenge of course for ourselves and indeed the Irish government is to ensure we stay here long term." Avolon's parent company is a Chinese group called HNA who just recently sold a 30% stake in Avolon to Orix, a Japanese financial services company in a $2.2 billion deal. The deal valued the company at $24 billion, "which in itself is quite spectacular, given that we were a start up eight years ago". Dómhnal Slattery said the move accelerates the company's roadmap to investment grade. "We need to become an investment grade borrower which will lower our costs of funds, so the transaction with Orix enables that. Orix is a very significant player in the Japanese financial markets which in turn is one of the largest markets for financing aircraft worldwide, so certainly I would describe it as a win win, and we're thrilled to have them as a shareholder." The Chinese firm, HNA went on a spending spree in recent years, making a number of acquisitions. It now faces the challenge of debt, but Mr Slattery said Avolon will not be affected by HNA's debt burden. "We have insulated our company absolutely, in fact from any of HNAs challenges. HNA is one of the largest customers of Boeing and Airbus in the world. They operate 24 different airlines, so we leverage our buying power with HNA so the way I think about it, at this juncture is, we now have an excellent balance sheet with Orix on board and we probably have the best buying power in the market with HNA's buying power." At the official opening of Avolon's global headquarters in Dublin today, Taoiseach Leo Varadkar said Ireland is a leader in global aviation finance because of its "highly skilled workforce, robust regulatory framework, competitiveness and pro-business policies". He stressed the importance of the aviation industry to Ireland and said a new Postgraduate Diploma in Aviation Finance and Leasing, an MBA in Aviation Management Stream, and an Aviation Future Leaders programme will be established to solidify the country's future in the aviation industry. Mr Varadkar said aircraft leasing will be an important focus of the Government as it develops a new strategy for the international financial services sector. MORNING BRIEFS - Irish homebuilder Glenveagh Properties generated €1.3m in revenue, according to its interim results for the first six months of the year. The underlying gross margin on its residential completions was 16.7%. Operating loss for the six months was €7.8m. It said that it has now spent €479m on land assets since its IPO last October. Construction has started on 12 sites with about 800 homes expected to be under construction this year. *** Interest payments to service the €201 billion of national debt are costing the State €1 euro for every €13 spent. The latest Department of Finance annual report on public debt shows that the sum owed per person in the State remains at €42,000. Minister Paschal Donohoe has said it is crucial the country reduces the national debt. *** The country's manufacturing sector gained momentum over the summer with sharp increases in new orders and output recorded in August. The Investec Manufacturing Purchasing Managers' Index rose to 57.5 from 56.3 in July to extend a run above the 50 mark. The growth in new orders was the main reason for a sharp increase in production. *** Bio-pharmaceutical company BioMarin is to invest almost €37m at its plant at Shanbally in Co Cork, .. bringing employment there to over 400. BioMarin manufactures drugs and therapies to treat rare genetic diseases which mostly affect children. *** Turkey's inflation rate climbed to almost 18% last month with rapid price gains reported across a wide range of categories. The lira was already under pressure before the inflation data was published this morning, sinking more than 2% against the US dollar.